Holloway Road, junction of Jackson Road: Paying tribute to Sam Harding. Last night, I was at the spot where Sam Harding (25) died last Saturday. 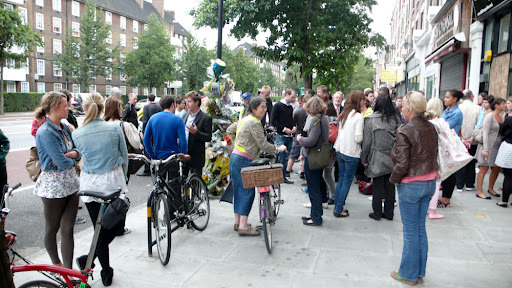 The Islington Cyclists Action Group, the local branch of the London Cycling Campaign paid tribute to the Sam. It was completely heartbreaking and very unsetteling. Sam’s family and a lot of his friends showed up trying to cope with the unexpected loss of a loved one. The Islington Tribune has published a long article about the gathering. According to various press reports, Sam was cycling southbound on Holloway road. Right in front of Holloway Cycles slightly north of the junction with Jackson street a door of a parking car was opened (apparently by a child) and hit Sam. He came off and was immediately afterwards run over by a TfL, as the Camden New Journal reports. This is the second fatality in seven days. At least 12 cyclists died in the capital in traffic accidents in 2011, plus at least two more in just outside of the boundaries of Greater London (details of all fatal crashes since 2006 here) ashes here: moves me especially because I live literally around the corner. My personal lesson from this tragic incident is: Keep away from the door zone! I’m trying to pass parking car with enough distance so open doors don’t hit me. I’m also trying to avoid busy roads like Holloway road as much as possible. Most severe crashes involving cyclists happen there. Cycling on quieter roads is possible most of the time. Sometimes, this means taking a slightly routes and it takes a few minutes more. However, less traffic mean fewer vehicles that can possibly kill you. The big lesson for drivers is: Do a shoulder check before getting off a car. And please, please, put the child safety lock in action when you’re driving around with kids. The police is still looking for witnesses of the crash. Please call the Road Death Investigation Unit at Alperton (0208 998 5319). The police wants to talk to passengers who were on the 153 bus involved in the collision. Not sure of the exact details but my understanding is that the victim was a young lad of about 12 years who cycled into the path of a 153 bus travelling in the bus lane on the holloway road. The bus went straight over him and killed him instantly. I don’t think any blame can be lain on the bus driver in this case. It was a terrible incident that happened outside my window, we heard a loud bang followed by screams and the cyclist was caught under the buss, it took a very long time to actually get the buss lifted and the hole road was blocked off for a good 3 to 4 hours, it was heartbreaking to see such a fatality, but it was to late for the paramedics to do anything as the man had died quiet soon after the collision, its terrible to see a life taken so quickly god bless his family and friends. It was so sad to watch as he was laying under the buss for so long before they got the body out. The road has just returned to normal about an hour and half ago, Something needs to be done with these buss lanes i do find the buses drive far to fast and its such a busy road, a tent was placed to refrain anything being seen by the public and soon after the private ambulance arrived. The driver of the buss looked shaken up. I myself will be laying some flowers by the tree rip. “A CYCLIST has died after a collision with a bus in Holloway Road this afternoon. Police are appealing for witnesses to the incident near the junction with Jackson Road just after 1pm. The 25 year-old died at the scene. Investigators said initial reports suggested the cyclist had collided with an open car door prior to hitting a single decker bus. The driver of that car, an Audi, was arrested and is in police custody tonight. A post-mortem is expected to take place on Monday. Next of kin have been informed. Ok – that would make a bit more sense as I saw the Audi being lifted onto a police trailer. The word among the onlookers was that it was a kid, so that was wrong. In any event, it sounds like a really unfortunate set of circumstances. In answer to the poster above, I don’t think that the buses are travelling at excessive speeds at that location – in fact there is a speed camera 20m on from where the accident occurred which was just outside Holloway Cycles. It may appear that way due to the line of traffic that builds up from the next junction and is usually very slow moving compared to the free-flowing bus lane. Sad news in any case. I was there at the accident, on my bike, and it shook me up a bit seeing the aftermath. It just reinforces how bad some London drivers are, apparently car doors opening with looking is the highest cause of bike accidents in London. I always give parked cars a metre or so room but it would be nice if the drivers would look before opening their doors. I hope he’s made an example of.